Battles continue between pro-government forces and insurgents in Aleppo’s Old City, with Damascus slowly winning back territory. 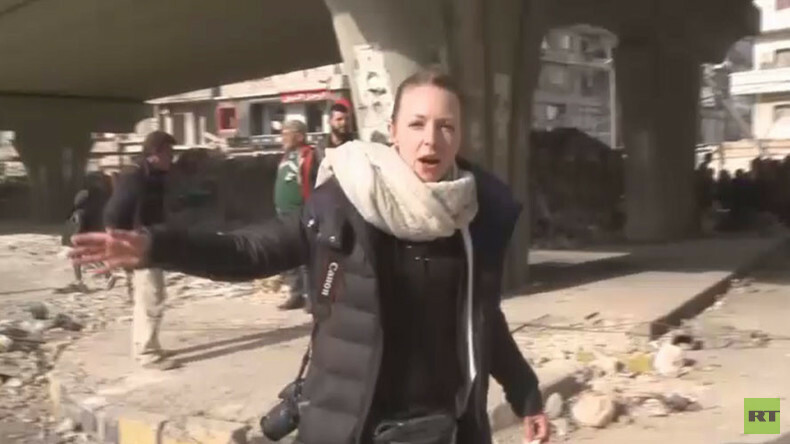 RT’s Lizzie Phelan and her crew were the first journalists to visit the neighborhoods just captured by the government. “It is still not entirely safe here. The opposition forces are only a couple of hundreds of meters away. The area needs to be cleaned from unused weapons and mines left,” she reported by phone. She said her crew saw many weapons abandoned by the militants stashed in buildings, including the home-made gas cylinder rockets they have been using to shell government forces. “The battle to take the old city over the last few days has been extremely fierce. Opposition forces have been desperate to fight back and prevent government advances. They have been relentlessly shelling the government-held areas of Aleppo. There have been many civilian casualties [there],” Phelan added. The footage, her film crew took in an area of the Old City captured by the government overnight, shows a mortar position, equipped by the terrorists in the courtyard of a former bakery and used to fire at western Aleppo. Phelan added that residents of the captured areas now have the chance to escape the frontline and meet relatives they had been separated from. The terrorists and rebel militants prevented civilians from leaving for the government-held part of the city. “Many of those people have not seen their relatives for over four years,” she said. Meanwhile, Syrian government forces have taken twelve more districts in eastern Aleppo over the last 24 hours, according to the Russia-backed Center for Syrian Reconciliation. Forty-seven districts are now said to be under the Syrian Army’s control. The streets in liberated areas were littered with improvised mortar launchers used by the militants to attack government-held areas, Phelan said. The Syrian military warned the RT crew to be extremely careful as the retreating gunmen left booby traps in the buildings, which are yet to be cleared. “There’s an unused mortar. There’s an unused gas cylinder ready to be fired, and booby traps everywhere,” Phelan said as she observed the surroundings. She also witnessed the Syrian military helping to evacuate an elderly couple who were too weak to walk unassisted and needed medical attention. The RT crew filmed huge barricades, which militants erected by piling busses on top of one another, to separate the territory that they were holding from the Syrian military. Phelan said that scores of civilians were evacuated from the Old City to government-held areas, with many people in need of medical attention. “It’s absolute chaos here,” she added. There were people lining up near military checkpoints in western Aleppo, hoping for their relatives to arrive from the newly-liberated areas. One man told RT that he had been separated from his family, who remained in a militant-held area, and hadn’t seen them for five years. Another Aleppo resident said that his family was also stuck in eastern Aleppo, adding that they had previously tried to make it back, but were prevented from doing so by the rebels. The part of the city controlled by terrorists and rebel militants has been steadily shrinking over the past week as the Syrian army advances on their positions. Earlier, Russia offered the remaining rebels the opportunity to pull out of the city, while warning that those who refuse the offer and stay will be considered terrorists and, thus, legitimate targets. It was expected that the solution would be backed by the US, but American diplomats abruptly postponed talks scheduled for this week, while withdrawing its own proposal, which reportedly detailed the pullout plan.